How is Pitra Dosha formed ? How to identify the effect of Pitra Dosh ? Ancestors & forefathers are known as Pitra or Pitru. Pitra are those ancestors who died unnatural death and did not get salvation. Due to this, people perform remedies for the pacification of Pitra Dosha. Manes who are unsatisfied also want to get relief from Pitra Yoni. In Vedic Astrology, the ninth house is the house of fortune in the birth chart. This house has great importance as this house also also governs the father and the manes. If Sun and Rahu form conjunction in this house then Pitra Dosha is formed in the birth chart. As per Vedic scriptures, auspiciousness of that house will be removed where Sun and Rahu are placed together. As per Vedic seers, this yoga is formed according to the sins of previous birth. Pitru Dosha has many adverse effects like childlessness, joblessness, professional stagnation, family conflicts and prolonged illness. Pitra Dosha is formed if anyone in the family dies unnatural death. It can also happen if family members do not offer water and food to their manes or do not remember their manes during the spiritual activities. Pitra Dosha also occurs if any family member kills a cow or destroys a foetus in the womb. The ninth house is the house of father and forefathers. Sun as a Karaka planet of father is also the Karaka planet of progress, age, promotion and spirituality. If Rahu which is malefic and shadow planet affects the Sun then it forms Grahan Yoga and Pitra Dosha as well. If this Yoga is present in the the birth chart, the person gets delayed support of his luck and has to struggle a lot to achieve even the slightest of success. Pitra Dosh can be a major factor behind a problem in conceiving the child, i.e. problem in getting pregnant or repeated miscarriages. Pitru Dosha is found if only a girl child is conceived repeatedly. Pitru Dosha causes quarrels among family members without any reasonable reason. If a native has a Pitra Dosha then the educational and career growth is obstructed. When Pitru Dosh occus the family doesn't grow and faces many problems repeatedly. In a family with Pitra Dosha the effect of BLACK MAGIC is found in aura scanning. Pitra Dosh results in an inability to get married without any reason, though well qualified. Very good earning. Pitra Dosha causes Marital disharmony. Students with pitra dosha in their charts have a tendency of going blank in examinations despite being well prepared for them. Pitra dosha causes repeated loss of job or unexpexted changes in job. A family afflicted with Pitra dosh suffers the death of children in their childhood i.e. below 3 years old. Shaant Pitra: These are those who become Pitra after death but are out of the human issues. They believe in God and do not care if they are worshiped or not.These Pitra are involved into "Bhajans" and "Satsang". Ashaant Pitra: These are those who are dead but are still attached with their family emotionally. They want the same respect and care as the other family members get. They are very effective in giving results and once happy they can bless their successors with success of all kinds. Pitra are the key to family success. Pitra are essential part of family even after death. Pitra can save us from many unexpected issues. Pitra make environment positive and energetic. 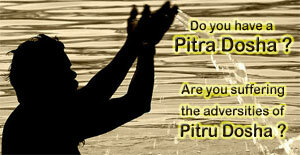 Pitra helps in getting success. Pitra provides peace and prosperity.